Keeping inspired is essential in a freelance creative career, and it can be a really rewarding experience to explore new techniques and styles outside of what current contracts call for. These ‘Passion Projects’ show what you’re capable of, and may well be the items in your portfolio which lead to further related work. Party on! 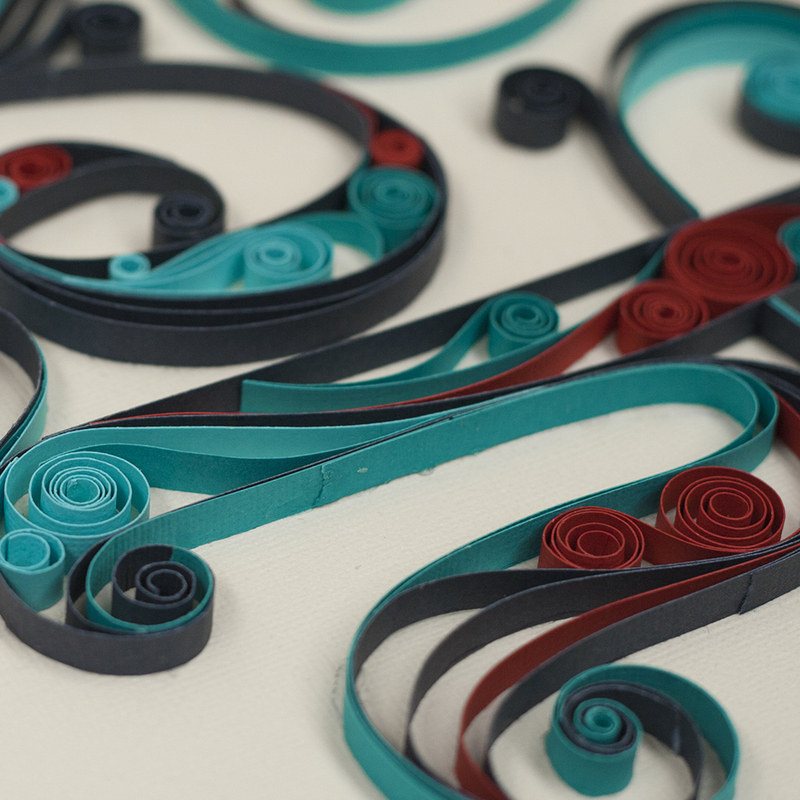 My latest exploration is a introductory attempt at Quilling. I try to exercise my creative muscles every day, even if it means staying at the studio after dark to throw some glitter around after spending all day hustling anchor points and bézier curves. The crew at Warehouse Stationery asked me to collaborate with them, as the company is celebrating their first ever July Create Month. I’m keen to inspire and encourage other peeps out there to get their creative juices cranking whenever possible, so am creating a mini series of juice-inducing artworks and will be posting them on my Instagram account. Big ups to Warehouse Stationery for letting me fill my shopping basket with fun new materials to play with! Below are a few tips I picked up along the way whilst creating this piece. Same idea applies here. Hold your thumb over the edge of a large needle edge/compass tip/crochet hook, and drag the strip of paper along in a fluid motion – bingo bango: neatly curved paper. To make the super tight curls, take that same needle tip and wrap the pre-curled paper around the tip into a tight spiral. I found it helped to pre-curl the paper as it somewhat softened it/coerced it into being curved without getting hard edges or split paper. Try to mould the shapes of the letters as close to the desired shape as possible before doing any glueing. Use your tools to create curves in the right places, getting tighter or inverse as required, then pick the strip up with tweezers and glue the edge before placing the strip back down and into place. There are plenty of full tutorials inside the internet about quilling, For this post I just wanted to share a few pointers I picked up along the way.